It's easy to say that racism ended when the civil war did, but as years have passed it is clear that this is not true. In the past few years there has been some light shed on the crimes that are committed against people of color, but it has not been covered well enough. Not only is the media doing a poor job of covering the victims of these crimes, but they also are not reporting well on the ones committing them. When people think of the word "terrorist" they should be thinking of anyone who "intentionally uses indiscriminate violence as a means to create terror, or fear, to achieve a political, religious or ideological aim." Unfortunately, many people only think of foreign individuals coming to the United States to harm us, when most of the terrorism in our country stems from white people. White supremacists have carried out more terrorists attacks than ISIS, but why does it seem like in general society is more afraid of ISIS? It's imperative that the media does a better job of educating the public on the real threat: the people we interact with everyday. Christian Picciolini who spent 25 years as a member of the skin head movement says, "It's the average American, it is our mechanics, it's our dentists, it's our teachers, lawyers, doctors, nurses and unfortunately that's the way it's turned into the last 30 years." Do media outlets not write about these racist groups because it will become an "unpopular opinion?" Americans want to be able to point to a group, living hundreds of thousands of miles away and put the blame on them for the divide and chaos in our country. When in reality, it is caused in most part by people that live much closer. Without proper coverage of the actions that are carried out by white supremacists groups, like the Klu Klux Klan, they will continue to grow and prosper. There are over 917 documented hate groups in the United States, and as a member of this society I find it terrifying that I've never really heard of any of them. While writing about what these groups are doing is not going to dissolve the issues, it will raise awareness. It is hard for people to put an end to the hateful activities without being knowledgeable about them. 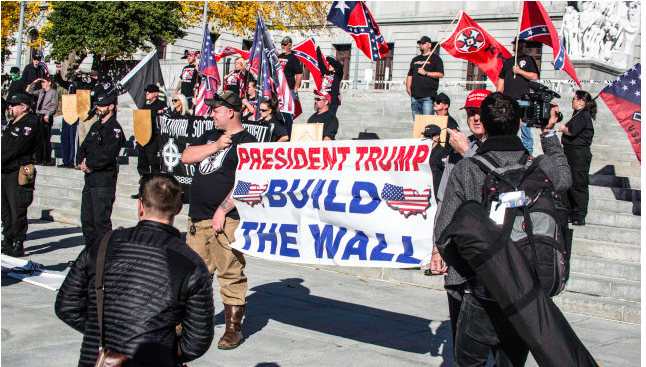 With the election of Donald Trump many hate groups feel as if they have more freedom to their racism due to Trumps many disrespectful comments about immigrants. However, Donald Trump made it clear that he does not support the white supremacists groups and does not want the support that they were offering him. A White Supremacist group supporting Trump after he is elected into office. It's simple: the media needs to report on these events. The public deserves to know that these monstrosities are being committed and what they can do to put an end to them. The threat is in our own backyard and were ignoring it.